Until one fateful day in May of 2012, Skye was a competitive athlete in Flyball and Agility. When Skye tore his Cranial Cruciate Ligament in his left stifle (the equivalent to the ACL in people), Skye was forced to take a seat on the bench until his stifle was stable enough to once again compete. On May 16 2012, Skye underwent a TPLO (Tibial Plateau Leveling Osteotomy) which is designed to stabilize the stifle without repairing the actual ligament. It’s been a long road to recovery for Skye. His treatment initially consisted of walking in the underwater treadmill to promote strengthening and cold laser therapy to facilitate healing and decrease pain and inflammation. Once adequate bone healing had occurred, we began to emphasize strengthening with interval work in the underwater treadmill and land-based therapeutic exercises. As Skye progressed, it became apparent that he was sensitive to the implanted hardware from the TPLO procedure as he was still offloading from his left hindlimb. On October 10 of 2012, Skye underwent another surgical procedure to remove the hardware, which is no longer necessary after the bone has completely healed from the initial procedure. Once the hardware was removed, Skye progressed very quickly. He was soon able to do trot intervals in the underwater treadmill without breaking a sweat. 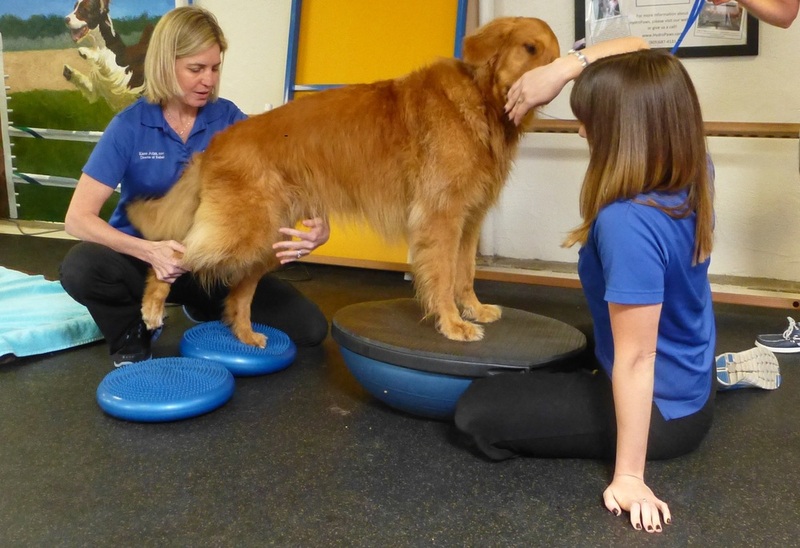 He easily mastered the land-based therapeutic exercises, which included walking through a ladder, jumping over 24” cavaletti poles, and balancing on both a BOSU ball and balance disks at the same time! In March of 2013, Skye was finally able to return to one of his favorite activities, agility. Skye has continued to improve and has finally returned to the performance level he was at before his injury, if not even better. His owner is still hopeful that Skye will one day be able to return to his favorite sport, flyball. While Skye has a blast at this sport, it does put a significant amount of strain on his other stifle, so he will only be able to return to this activity competitively if he can master a new method of turning. We at HydroPaws are all so proud of everything Skye has accomplished and love watching him enjoy all of his favorite things!